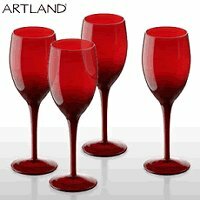 The most popular types of drinking glass are those made of glass. It is a stylish material, versatile and nice to drink from. Within the glassware range are many more types, often associated with the kind of drink - beer, wine, spirits etc. Drinking glasses are usually made from normal soda lime glass which has not been treated. These are normally cheap to produce and most people have a stock in their cupboards. Crystal glasses are made from leaded glass. They are expensive but have the feel of luxury. These are not dishwasher safe and care needs to be taken to prevent costly breakages. When either of these materials break, they form sharp shards of glass which can cause injury. To help with this problem, some glasses are made from toughened glass. They form small cubes when broken that are much safer. The quality has to be good, however, otherwise a small impact can cause the glass to shatter, spewing the glass cubes over a wide area. Plastic glassware is another option for safer glasses. It is clear to see why children's glasses are made from plastic but not so nice for adults to drink from, particularly if it is an adult drink! Few drinks are more adult or elegant as a glass of wine drunk from a wine glass. There is more to a beer glass than meets the eye. The design of the glass can enhance the drinking experience. Measuring wines and spirits can be done using a shot glass.